Raise your hand if you’ve ever checked the calendar on a Friday night and realized it’s date night! BUT you don’t have a plan or any ideas, so you end up with the same old dinner and a movie. Nothing wrong with a nice dinner out and seeing a good show, but we love to mix things up with fun, unique date experiences that will bring you closer together as a couple! 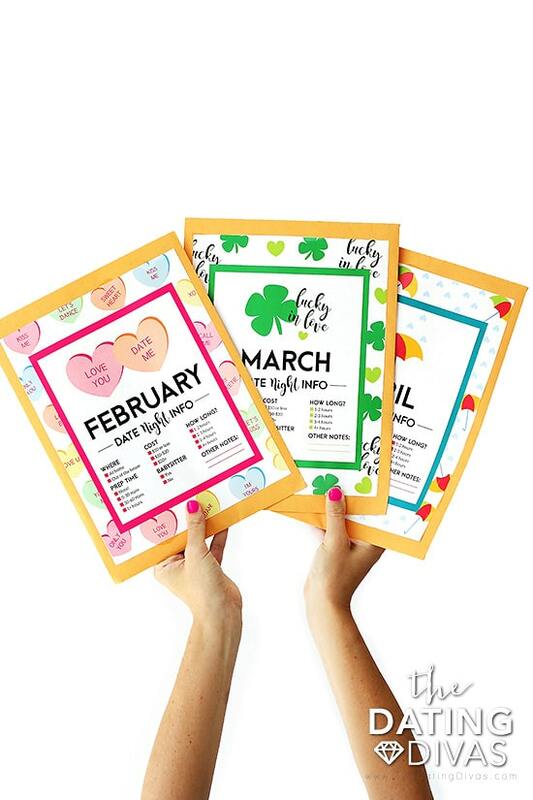 We’ve put together a cute and easy way to help you plan your dates in advance for a whole year. 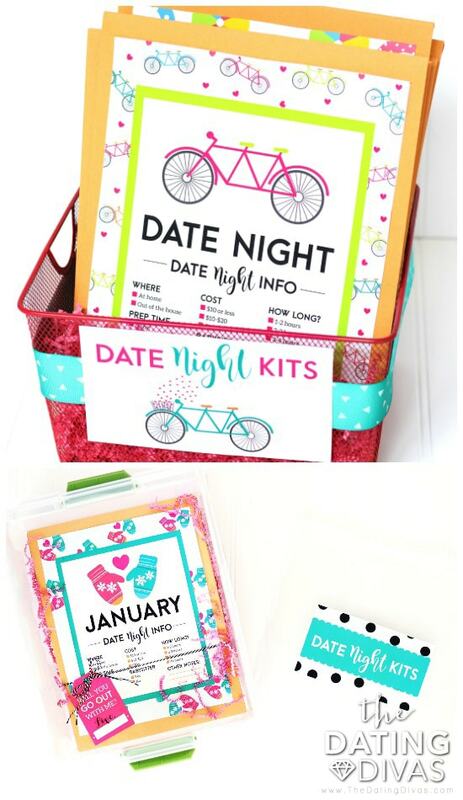 These date night kits are for each month, neatly packed into a manila envelope! Just glance at the label and you know what to prepare for your date together! Ok, can we just raise our imaginary glasses (if only we were all lucky enough to have something yummy to drink right now!) to miss Courtney from Paperelli Designs?! 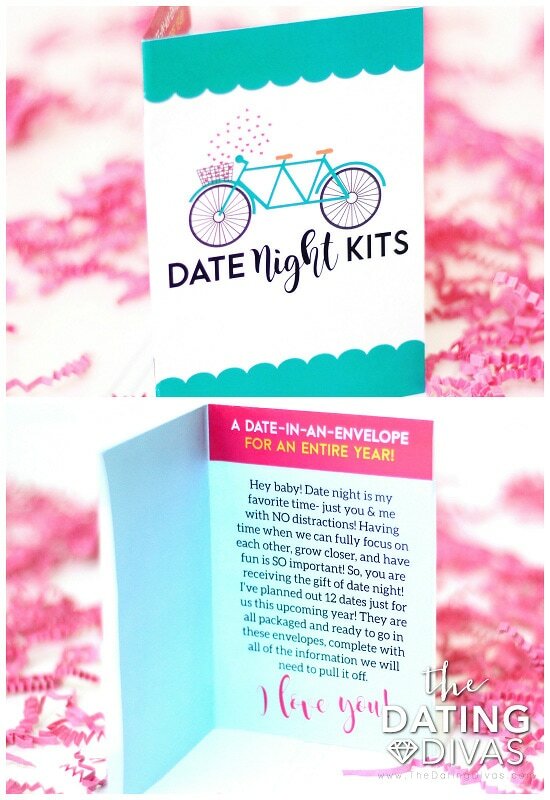 Cheers to you girl for creating such FUN date night kits!! These cute envelopes are TO. DIE. FOR! The seasonal prints she designed for each month are just too GOOD! Check out her funny cards and darling prints in her Etsy shop (you won’t regret it!). Cute Envelope Covers for 12 Months – Manila envelope labels to match each month based on season and holiday! 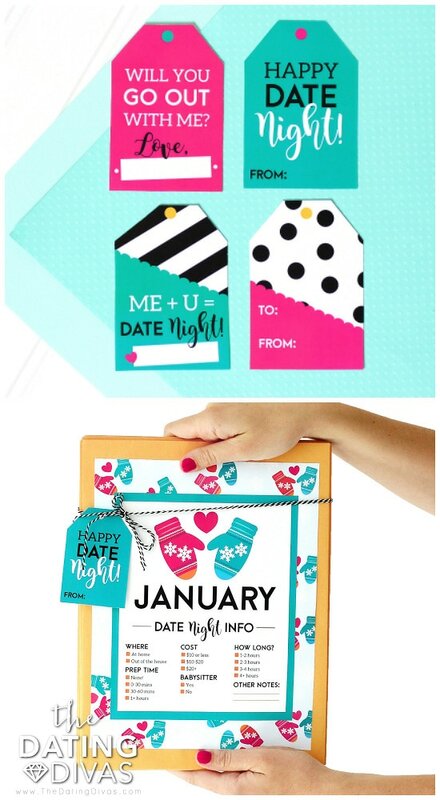 Our cute envelopes will add color and excitement to your date night organization! General Date Night Envelope Covers – If you want to prep a set of any-time date night kits, these labels are general, not month specific. But still, oh-so-CUTE! When it comes to creative envelope ideas, we’ve got you covered. 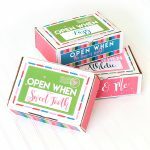 Gift Basket Labels, Tags and Instructions – Everything you need to package this set as a darling gift! This would be the cutest bridal shower gift! If you want to prepare dates that aren’t month or season specific and use them ANYTIME, we whipped up some general labels to stick onto a more versatile date night kit! Receiving 12 months of dates in these C.U.T.E. envelopes is a gift we would ALL appreciate (if anyone wants to make this for me and my husband, I won’t stop you!). To tie it all together, throw your envelopes into a cute basket or container. Wrap it up with a ribbon and attach one of our basket labels to add an extra cuteness factor! Then, the recipient has somewhere to store the envelopes the whole year too! Along with the labels above, adding a little gift tag will let you sign your name and add it to the packaging. You are definitely going to want to take credit for gifting this baby! Slip this sweet little card in with your gift, explaining how to use the set of envelopes and getting them PUMPED for their year of dating! We Divas are ALL about making date night a consistent habit, so we love to come up with creative ways to keep date night happening all year long. Our 52 Dates for Two album is a brand new idea for you! They are perfect gifts for your spouse or any couple as anniversary gift!! Our best-selling Year of Dates Binder has everything you need! The Year of Dates Binder 2.0 is full of our latest and greatest date ideas! I'm a happy gal who's lucky enough to have the sweetest, goofiest, most handsome husband, and two darling little girls! I try to stay positive, look for the best in others and my highest priorities are my faith, family and friends. Some of my favorite things include cuddling (I wish it was my full-time job! ), yoga, DIY home projects, donut hunting, bike rides, parties, picnics and trying new recipes. I have a serious sweet tooth and will do anything to get to sunshine & the beach! We LOVE hearing from our readers! Thanks for leaving us some love! P.S. If you want a picture to show up next to your comments, get set up with a gravatar! These are SO darling and I love how organized it is! It would be so easy to just prep these once or twice a year and then you’re SET! Does this include the dates? If so, do you have a list of the dates like you did for the binder one? Hi Nicole! This set actually doesn’t include the dates, just the envelopes and packaging! 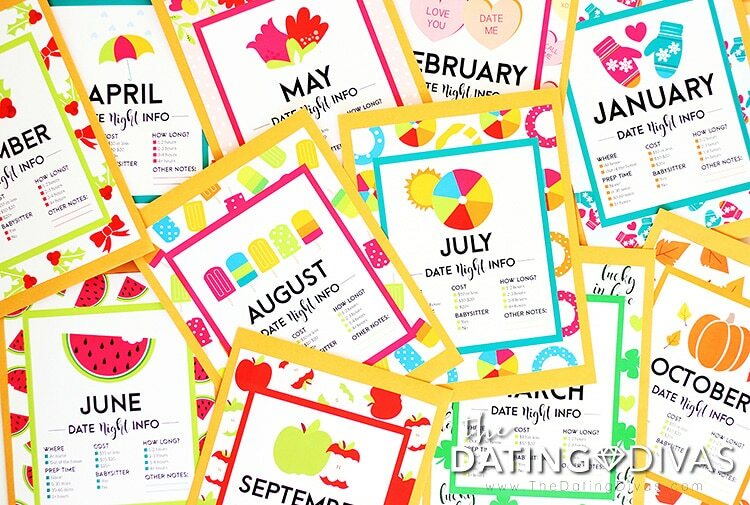 But once you download it, there is a big list included of our favorite dates we recommend using. You can decide which ones look the most fun to you, click a link, and it will take you right to the page to download them for free! THESE ARE SOOOOOO CUTE!!!! I’m in love!!! So what’s inside the envelopes? I’m not seeing that info. Hi Corinne! There’s actually nothing inside the envelopes- it’s totally customizable so you add your own dates that fit your relationship! 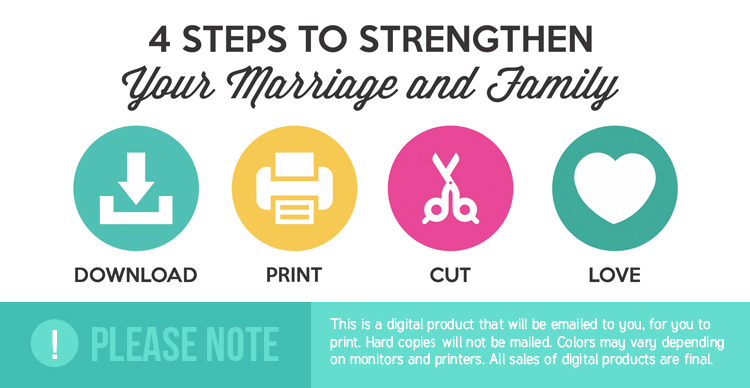 Once you purchase the kit, we’ve included a big list of some of our favorite dates that you can click over to and download all those printables for free! Do you do these in £ instead of $ for how much will cost? Hi Jenni! We accept any credit card from around the world (except American Express). The conversion rate comes out to be about £8.46. Thanks! So Cute! 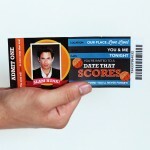 How many generic date night labels come with the set? Hello Gabby, Do you have something similar for kids? This is such a great idea and I would love to do it with my kids too. Hey Liz! 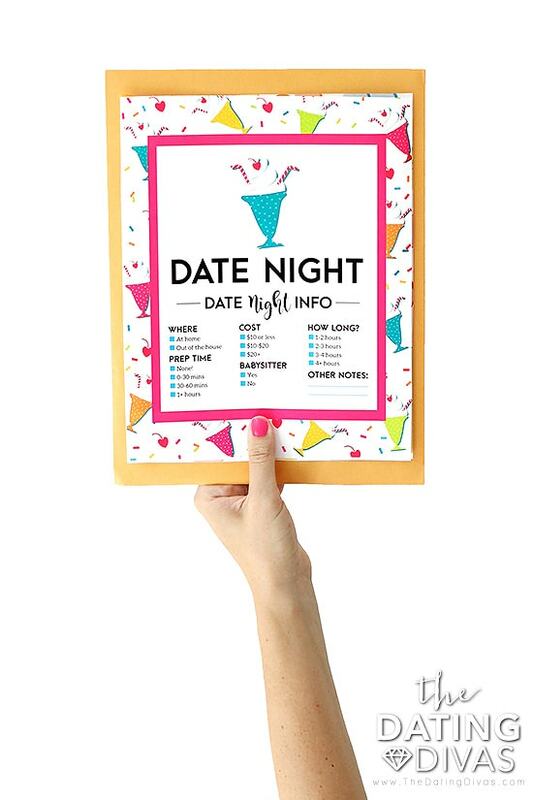 We actually have a Year of Kid Dates binder in the works, complete with 12 date ideas and printables for parents & kids to do together! Stay tuned! Back in May 2017 you guys were in the middle of a kids’ date binder. Is it available to purchase yet? And thank you for bringing fresh ideas to my relationship.